At Wave Dental in Warwick RI, we offer dental implant services for our patients. If you've lost teeth due to injury or disease, this procedure could be just the thing to give you back your smile. Not only do they help you look better, they also help keep your mouth healthy and functioning well. We're happy to be able to offer our patients a full range of general and cosmetic dental services. Our goal is to build long-term relationships with our patients so that we can help them have a lifetimes of good dental health. The implant procedure that we offer differs from traditional dentures in significant ways. With traditional dentures or partials, you wear a removable plate with attached prosthetic teeth. 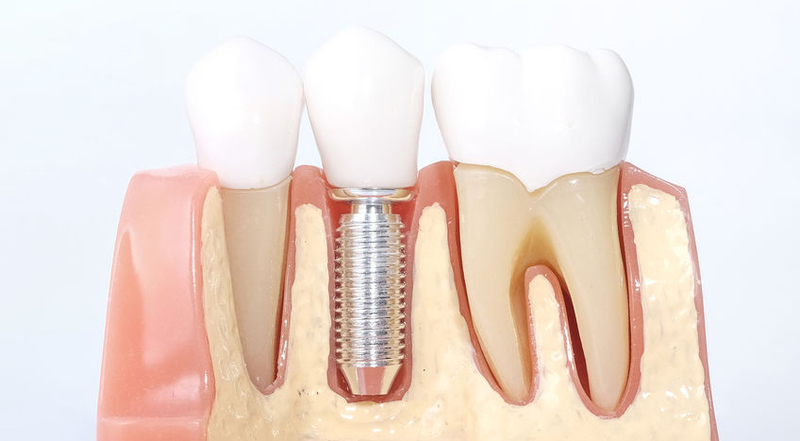 With implants, the prosthetic teeth are attached to a tiny titanium screw that has been placed directly into the jaw bone where the tooth is missing. The screw integrates with the bone over time and serves as a strong and functional root. You treat your prosthetic teeth just like your normal teeth! At our office in Warwick RI, dental implants and many other smile-enhancing treatments are provided to help you enjoy a strong, bright, and healthy smile throughout your life. Kenneth J. Rudman DMD has been a restorative dentist since 1982, and his experience and expertise makes all the difference in the positive results you get from his treatment. Don't live with missing teeth any longer, give our office a call today!